Novelist K-8 helps students find books that are just right for them. This site is visually appealing and user friendly. Students can search books by their age, genre, keywords and topics. Teachers can also use this site to find books. 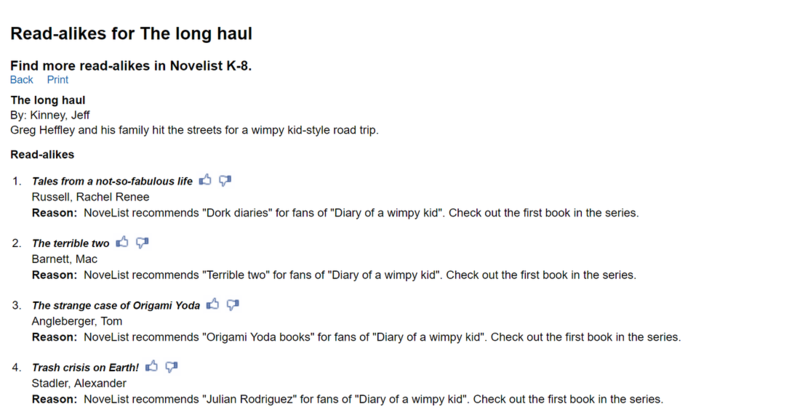 I noticed that you can search audience age and then books read independently or read together. This resource would also be useful for media specialists looking for new books to purchase for their library. 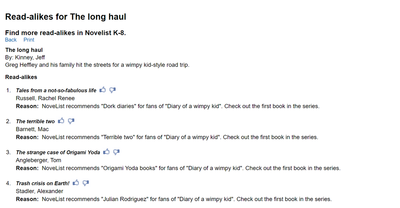 For example, the students at my school are constantly checking out Diary of a Wimpy Kid and Dork Diaries. I can look up one of these titles and then explore title read alikes, author read alikes, and series read alikes to find books that my students may also enjoy. I also noticed that when you select a title you can see how it is rated on Goodreads and read reviews from there. The advanced search option allows the user to search by lexile and AR level. The teachers and students will appreciate this option when searching for books that are just right. I’ve not used this website previously or known about it and I’m extremely excited to share this resource with teachers and students. Grades: K and up. Subject(s): Literature. Overall rating: 9.